Aside from the small group of individuals who have gone on to become Premier, few Ontarians today can lay claim to the executive leadership experience and skills acquired in the public arena by Tim Hudak. 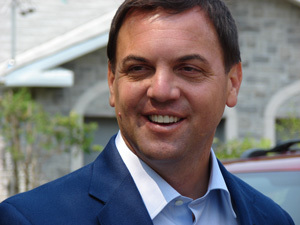 Mr. Hudak was first elected to Queen’s Park in 1995. He was appointed to Cabinet in three successive economic portfolios: Northern Development and Mines, where he cut mining taxes to the lowest in Canada; Tourism, Culture and Recreation, where he executed a plan to help these industries recover from the September 11th attacks; and Consumer and Business Services, where he took action to protect vulnerable seniors by overhauling outdated consumer protection laws. In each of these roles, Mr. Hudak managed a series of multi-million dollar budgets, directed public service employees numbering in the thousands and handled a cascade of issues involving powerful, and usually conflicting, stakeholder interests. All in the glare of relentless news media attention – and the daily “accountability bear-pit” that is Question Period. In 2009, Mr. Hudak won the leadership of the Progressive Conservative Party of Ontario. As Leader of the Official Opposition, he assumed control of a province-wide organizational apparatus and significant Leader’s Office, Caucus and Party staff and budgets. Mr. Hudak also spearheaded the development of his Party’s integrated and detailed policies for job creation and economic growth. And, as the public face of his team, he bore the scrutiny of what had by then become a 24-7 news cycle with humour and calm. Following his first outing as Leader in a provincial campaign, Mr. Hudak led his Party to the largest increase in the number of PC MPPs seen since the Mike Harris phenomenon of 1995. And over the course of his leadership, he raised some $50 million in contributions from Ontarians who shared his vision for a prosperous society of hope, opportunity and good jobs. Prior to entering public life, Mr. Hudak earned an Economics degree from the University of Western Ontario, and was subsequently awarded a full academic scholarship to the University of Washington, where he obtained his Master of Arts in Economics. He lives in Wellandport in his riding of Niagara West-Glanbrook, where he makes it a priority to spend as much time as possible with his family – his wife Debbie and their daughters Miller, who is seven, and Maitland, who is nine months old. In the June 2014 election, Mr. Hudak won plaudits for campaigning on a clear vision of greater opportunity for all Ontarians, based on an honest plan for jobs and economic growth and a government we can afford. He boldly championed the necessity of government that spends within its means, understanding that real compassion lies in having the courage to act. In September of 2016, after serving as an elected Member of Provincial Parliament for more than 21 years, Tim Hudak stepped out of public office to take a position in the private sector as the CEO of the Ontario Real Estate Association.